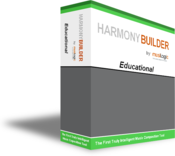 HarmonyBuilder (Educational) is a music theory software that enables composers of 4-part harmony to check for errors in harmony and counterpoint. Color-coding is used to indicate harmony errors as well as signal the presence of chords derived from the major or harmonic minor scales. Furthermore, this is the first program available on the market that automatically recognizes chords and accurately names them in both modern and baroque notation. The Educational version incorporates all the elements of the Basic version.